"Few people remember that but the coalition includes a number of non-factional deputies, for example, myself." 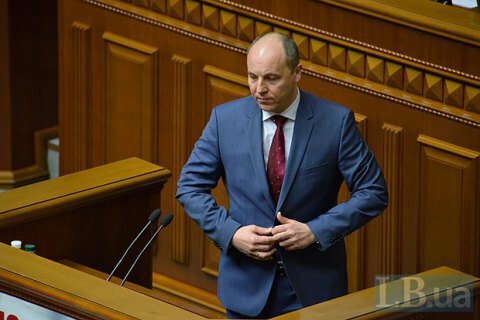 Speaker of the Verkhovna Rada of Ukraine Andriy Parubiy insists that the coalition in the parliament does exist and has at least 227 seats. "The coalition has two member factions: the Bloc of Petro Poroshenko and the Popular Front. The Popular Front is 81 seats, the Bloc of Petro Poroshenko has 140, which totals 221 altogether. In addition, through few people remember this, but the coalition includes a number of non-factional deputies who are members of the coalition, like [deputy speaker] Iryna Herashchenko here and myself," Parubiy said in parliament on Tuesday, 27 June. Among other non-factional members of the ruling coalition Hanna Hopko, Viktoria Ptashnyk, Ostap Yednak and Andriy Denysenko. "Those are just the lawmakers who have publicly announced their position. These six legislators- 221 plus six - are enough for the functioning of the coalition," he said. The speaker stressed that the key function of the coalition is to appoint a government, while the adoption of laws is a routine job that does not exclude the involvement of the votes of other factions and groups that are not members of the coalition. "Virtually every vote takes a different configuration, as it happens all over the world," Parubiy said. The coalition European Ukraine in Ukrainian parliament was established in late 2014 as part of the PPB, the Popular Front, the Radical Party, Self-Help and Fatherland". The last three factions later came out of the coalition, leaving the majority with less than 226 deputies. The collapse of the coalition has never been announced. Parubiy: "No reason to defer presidential election"